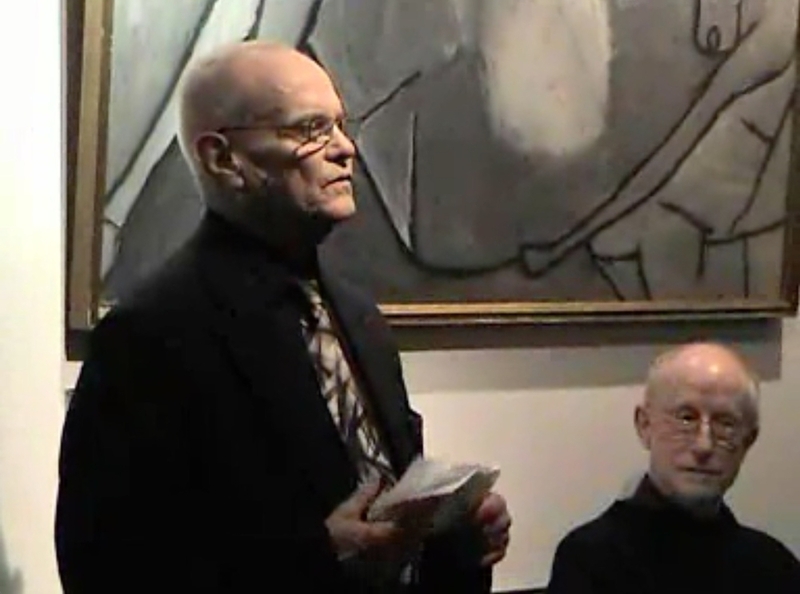 Archer makes his acceptance speech for the DRS Lifetime Achievement Award at the Royal College of Art, London in 2004, the year before his death. Seated listening to him is John Chris Jones, fellow recipient of the award. Taken from a video formerly available on a De Montfort University site. See text of Sebastian Macmillan's speech. There are multiple connections between the Design Research Society and the RCA's Department of Design Research, many centred on Bruce Archer, the Department's original researcher and later its Professorial head. Archer was Chair of the DRS from 1988 to 1990 and Honorary President from 1992 to 2000. The first Design Methods Conference was held in London in 1962, thirty-three years ago. But it was at the Second Design Methods Conference held in Birmingham in 1965, precisely 30 years ago, that the idea of founding a cross-disciplinary society for those interested in Design Methodology was conceived. The Design Research Society was duly brought to birth at an Inaugural Meeting held at the Imperial College of Science and Technology, London, the following Spring. Archer was part of the organising committee for the 1962 Design Methods Conference, though he did not contribute a chapter to the proceedings. The Design Research Society often traces its origins to the Conference on Design Methods held at Imperial College London in 1962. Organisers from the RCA were Frank Height (1921-2013, a key figure in Industrial Design (Engineering) and in ICSID, and Bruce Archer, then only in his first year at the College. I was concerned to find ways of ensuring that the predominantly qualitative considerations such as comfort and convenience, ethics and beauty, should be as carefully taken into account and as doggedly defensible under attack as predominantly quantitative considerations such as strength, cost and durability. Moreover, it is demonstrable that the assumptions upon which even the quantitative considerations are based can never be wholly value-free, and I wanted these assumptions to be at least acknowledged in the design process. The study of methods was thus not an end in itself, and was certainly not motivated by the desire to eliminate or down-grade the qualitative considerations, although a lot of people interpreted it that way. The second contribution to Design Studies 1(1) is an extract from a lecture delivered by Archer at the Manchester Regional Centre for Science and Technology on 7 May 1976, under the title 'The Three Rs.' It represents a dramatic shift in Archer's thinking. He argues that Design should be regarded as a fundamental aspect of education - in no sense a specialised subject - and that Design is (or should be) on a par with, and distinct from, science and the humanities. Archer's delineation of Design as a third culture, distinct from the humanities and sciences, based on a lecture given in 1976 (Archer 1979:20). Design Research, the newsletter of the Design Research Society, in December 1986 reflects on the closure of the RCA Department of Design Research (1961-1986). Bruce largely invented the discipline of design research, and has made a number of vital contributions to its establishment. He demonstrated that evidence-gathering, systems-level analysis, and field testing were necessary in industrial design, and argued for greater rigour in design practice to ensure decisions are well-founded, recorded and explicable so they can, if necessary be defended. He reflected on his experiences and captured their essence in seminal papers about systematic methods and the design process. ... He trained a generation of design researchers, introducing us to the principles and practice of scholarly enquiry. He foresaw the need for us to become a community to share our knowledge and experience - and helped to found the Design Research Society. Anything that can be said of me, and any contribution I have made is really down to the students and staff, who I enjoyed in those 25 years. There are more than a 100 of them and some have made it to senior positions in the academic world, and in the practitioner world. I salute you all. You are what have made design research what it is, and it is you, if you are able to seize the opportunity, who will make it into something more. For a discussion of Archer's changing views leading to the triad see SYSTEMATIC METHOD: DESIGN MAGAZINE AND A DOCTORATE. Archer, L. Bruce. 1979. Design as a discipline. Design Studies 1(1), July 1979. 17–20.